The Buehler IsoMet Low Speed Saw is a precision sectioning saw designed for cutting various types of materials with minimal deformation. 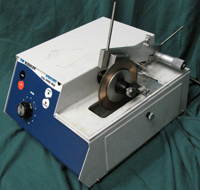 Its low kerf loss capability and great versatility in holding all types of sample shapes and configurations, gives today's laboratory a precision sectioning tool capable of cutting virtually any material including brittle or ductile metals, composites, cements, laminates, plastics, electronic devices and biomaterials. The Buehler AutoMet 2000 is a mechanically driven, non-pneumatic system that requires no air. The Automet upgrades the ECOMET family of manual bases to Semi-Automatic Systems and allows the user to begin the polishing process for later imaging and walk away during polishing thus increasing productivity and specimen consistency especially for multiple users and metallographers with little metallographic experience. The LED display allows easy use and the rim cabinetry is made of durable materials to resist chemicals. 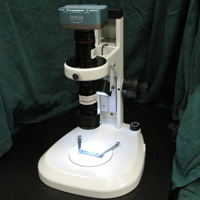 The Dino-Lite is an extremely portable microscope that hooks into any USB port equipped computer and allows on-site inspection of surfaces. Included software has built in measuring functions and image cataloging capabilities. 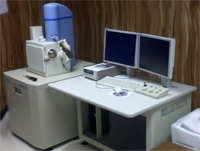 The JEOL JSM-6610LV is a Scanning Electron Microscope with 5x to 30,000x magnification. The GUI Imaging System has slow scan frame storage with up to 2560 x 1960 x 8 bit resolution. Specimen chamber has five axis, asynchronous motorized and automated adjuster. Includes a closed-loop water recirculator with a water to air heat exchanger for cooling the DP system. 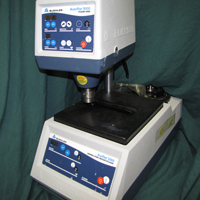 Includes a microtest tensile stage module for SEM with a high load (5,000 N) dynamic testing stage module operating in tension or compression. Includes a video capture system. 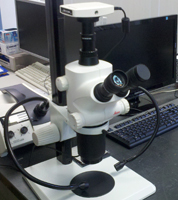 The Leica S8 APO Stereo Microscope has a magnification up to 80X optically and up to 240X with digital zoom. This benchtop system is excellent for quality control and provides easy optical viewing along with the ability to capture the image with the associated image analysis software. 10 MP video imaging at 35 fps, with a field of view of 91 mm to 0.4 mm and a working distance of 35 mm to 302 mm. System has both a fiber optic illuminator as well as a noise-free LED illuminator. Dual pipe light guides are also included with the system as well as an annular ring light guide.